a beautiful coastal wedding is planned. The invitations are out and the shower is in a couple of days. I decided to make a nautical tray for one of her shower gifts. I'm using her Wedding invitation and an old white chippy tray. this gave the distressing a layered effect. Dings and paint drips were on purpose to add character. I began by roughly painting an old tray, then sanding the daylights out of it to give it that old sea inspired look. Using Modge Podge, I glued the invitation, seahorses, and a starfish pictures to the tray. I let it dry, sanded it a little more because it can't be distressed enough. Then gave the tray several coats of Triple Thick to seal the deal. 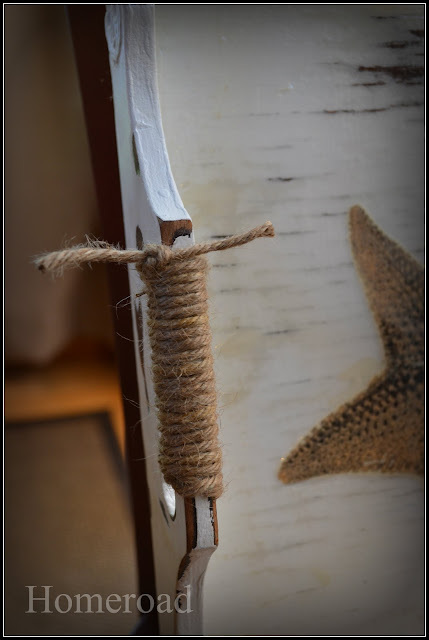 I added jute to the handles for some nautical love. I know you love your nautical look so I hope you'll love your tray Kim and Andrew! Love the twine wrapped around the handle! What a wonderful gift! It looks lovely! Sooo pretty!! Where do you get this triple thick stuff? Looks like something I can use!